And now, let's talk about Donousa (or Donoussa), the most distant island of Small Cyclades (Mikres Cyclades)! Donousa is well connected through regular ferries (3-4 times per week) with Paros, Naxos, Amorgos and Astypalaia. Apart from the regular ferry Donousa is also connected to the rest of the Small Cyclades islands with the legend of the Aegean Sea, the ferry "Express Skopelitis". Small Cyclades are the islands of Amorgos, Schinousa, Iraklia, and Koufonisia. The ferry tickets from Donousa to the other islands of Small Cyclades or to Naxos and Amorgos are quite cheap and thus facilitate island hopping between these islands. The town of Donousa is called Stavros and it is also the port of the island. During the winter Donousa is inhabited by 70-100 people, mainly living in Stavros. There is also another small village in Kalotaritissa. The key advantage of Donousa is it's beaches! 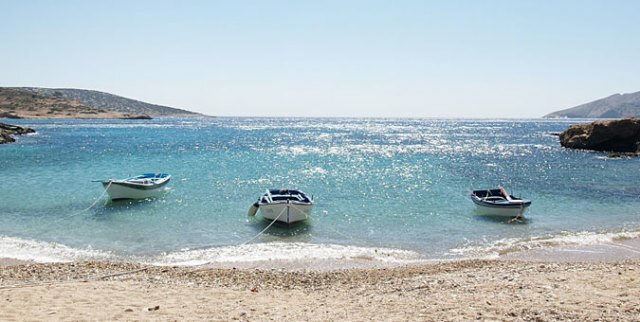 Near the port you can find extraordinary beaches like Kedros and Livadi, where you will be thrilled by the sea! Nice beaches can also be found around Kalotaritissa bay as Vlixo, Mesa Ammos and Sapounoxoma. You can find more info about these on the Municipality of Naxos webpage. PS: Do not forget to eat Patatato which is the highlight of the local cuisine!